Covering Dixie: Arkansas, recruiting, and more. Covering Dixie Like Mildew - The SEC, and just the SEC. You got a problem with that? A cocky James Franklin calls Nick Saban "Nicky Satan." Is Vanderbilt head football coach James Franklin getting a little big for his britches? Listen to him speaking at a high school in Macon, Ga. referring to Alabama HC Nick Saban as "Nicky Satan." Do you think Franklin would say that if the Commodores were facing Alabama this season? Me neither. Sure Vanderbilt is coming off back-to-back winning seasons and its first bowl win since dinosaurs walked the Earth 1948. Does that mean Franklin gets to throw a jab at Nick Saban? If he does he could have at least come up up with something original that didn't sound like it came off a t-shirt. Aaron Murray on a(n honors) roll, Johnny Manziel, Marshall Henderson, and more. Covering Dixie Like Mildew - The SEC. Nuff said. Arkansas Expats ponders how that bill in the Texas legislature to require Texas A&M and Texas to restore their annual rivalry game may effect Arkansas. America needs an early National Signing Day. Because For Whom the Cowbell Tolls Said So. Is Ole Miss guard Marshall Henderson "the Johnny Football" of SEC basketball?" Covering Dixie: Johnny Manziel and A.J. McCarron's NFL prospects, recruiting and more. Covering Dixie Like Mildew - The SEC, The SEC, and more SEC. Sign your name across my heart. Unquiet: BYU's independence, recruiting, more recruitng, and even more recruiting. Unquiet on the Western Front - Pac-12, Mountain West, and BYU news. Zach Bloxham declares that BYU's independent status in college football has been "a failure." California Golden Blogs tries to figure out how Cal's 2012 season went so wrong so fast. Juwann Day's Journey Into Night. Bruins Nation looks at UCLA recruiting. Nothing you can say can tear me away from my Gaius. Hawaii and BYU scuttle home-at-home series for 2013 & 2014. The changing landscape of conference expansion has taken its toll on the schedule of two college football teams once again. Hawaii and BYU have been forced to scuttle a home-and-home series between the two schools in 2013 and 2014. This year's game was scheduled for Dec. 7, which would have possibly conflicted with the proposed first-ever Mountain West Conference championship game. Both schools canceled the 2014 meeting as well, but are looking to scheduling another series in the future. 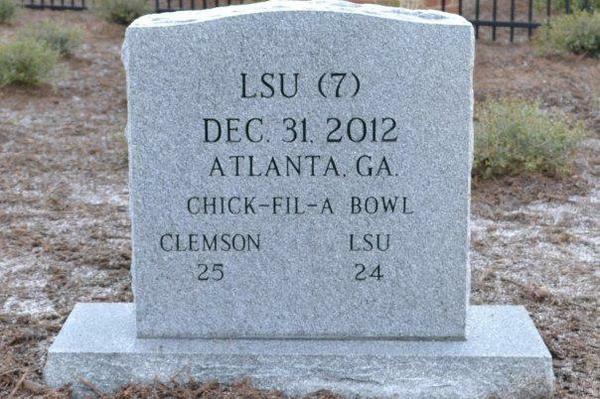 Clemson memorializes win over LSU in Chick-fil-A Bowl with tombstone in its Graveyard. Colleges tend to take their traditions a little seriously than they probably should. Clemson, for example goes all out with Memorial Stadium's "Death Valley" nickname with its very own Graveyard to celebrate victories over nationally ranked opponents whom the Tigers have defeated over the years. The school just added a new tombstone to the The Graveyard to honor its win over that other "Death Valley" school, LSU, in the 2012 Chick-fil-A Bowl. This is the first tombstone added since 2006, when Clemson defeated the then ninth-ranked Florida State on Sept. 16 of that year. For the record, this is the first time an LSU team has entered The Graveyard. North Carolina has four separate ranked teams memorialized with tombstones. Wake Forest, Miami, Georgia, Maryland, FSU, and Virginia each have two. Bill in Texas Legislature calls for renewal of Texas/Texas A&M rivalry game. A Texas legislator is trying to rectify one of the biggest issues facing the Lone Star State in these troubled times - the fact that Texas and Texas A&M aren't playing each other at the end of the season. State Rep. Ryan Gullen (D), an A&M grad, has introduced a bill in the Texas Legislature that would require the two schools to renew the cherish rivalry that ended when the Aggies defected from the Big 12 to the SEC. In a statement to ESPN, Gullen said "The purpose of this bill is to put the 'eyes of Texas upon' our two greatest state universities to restore this sacred Texas tradition. I think the people of Texas want a game, and we're trying to get them one." This is obviously a move made by a politician trying to get attention for himself and to woo over voters. 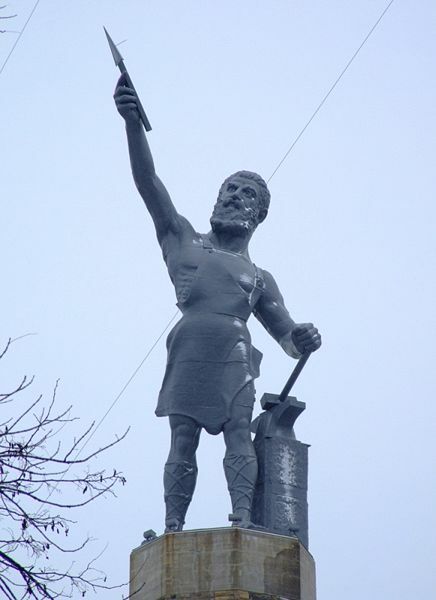 If Gullen seriously wants the Longhorn-Aggie rivalry game to return, he really needs to seek a higher power with the ability to make it happen . The one in Bristol, Ct. Covering Dixie Like Mildew: Tons of recruiting, Houston Nutt gets paid, and more. Covering Dixie Like Mildew - SEC news, notes, and seven BCS titles in a row (and counting). Mix nix Miss. St. commitment. Virginia will host Oregon on Sept. 7, first of a home-at-home series. Oregon and Virginia fans may want to start adjusting their schedules for this fall. The two schools have reached an agreement to play a home-and-home series which would start this coming season with The Ducks visiting the Cavaliers on Sept. 7. Oregon fans will have to wait a little while for the return trip by Virginia, however. It's tentatively scheduled for 2016. Virginia was originally scheduled to play Penn State on the road on Sept. 7. However, Penn St. canceled the game last week. Oregon was originally scheduled to play on the road against Nevada on Sept. 7, and still is, according to Oregon's official site. Threr's no word on the future of this game at this time. NCAA sanctions? What NCAA sanctions? In my mind I'm going to Carolina. Aw Dad, we're having to go to the Outback Bowl again? Lake the Posts takes a look at Northwestern's 2013 schedule, and predicts a 9-3 record. The Fallout: Johnny Manziel, the Senior Bowl, and more. 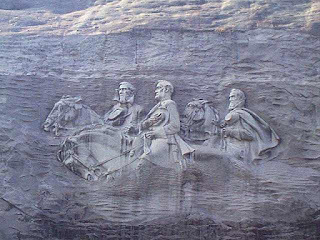 The South's Gonna Do It Again. James Scales is an ex-Duck. 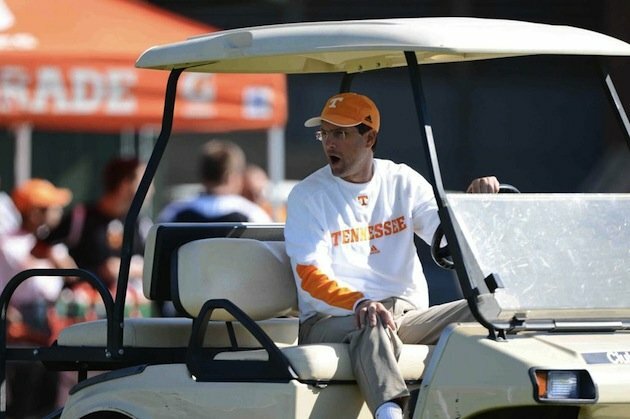 Derek Dooley is reportedly the Dallas Cowboys new wide receiver's coach. Dooley has a connection to current to Dallas HC Jason Garrett. They were both assistant coaches on Nick Saban's Miami Dolphins coaching staff. He would be replacing current Cowboys WR coach Jimmy Robinson, who will reportedly stay on in an consulting role for the team. No word yet if Dooley will be bringing his orange ceramic dog with him, though he will probably be leaving the orange pants at home. The Fallout : Johnny Manziel, Ronaiah Tuiasosopo, Todd Grantham, and more. Will the bar be higher for Johnny Manziel in 2013? Dr. Phil will interview Te'o Catfishgate mastermind Ronaiah Tuiasosopo. Don't get a piece of The Rock. Has Johnny Manziel set off a trick shot video war in the SEC? Don't look now, but Texas A&M starting quarterback Johnny Manziel may have started a trickshot war in the SEC. Manziel's trick shot video with the Dude Perfect crew is barely a day old, and Georgia starting QB Aaron Murray and his teammates are already planning their own. The bad news for Murray & Long: Johnny Football's already found out what they're up to. Then Bulldog offensive tackle Austin Long had to throw fuel in the fire and bring Johnny Football's infamous Scooby-Doo Haloween costume into this mess. This is bound to be a case of "this won't end well." Knowing the competitive nature of the SEC, things are going to escalate to a point where somebody is going to get seriously hurt. As for Murray, would he feel comfortable in calling out the reigning Heisman Trophy winner is the Dawgs and the Aggies were scheduled to meet in 2013? Didn't think so. Covering Dixie: Johnny Manziel, Les Miles, Bear Bryant's taylor, and more. Covering Dixie Like Mildew - SEC news, notes, and general insanity. Is Thursday for the Dawgs? Give me love. Give me hope. Give me strength. Give me something to live for. Shapiro lawyer goes Lee Harvey Oswald on the NCAA, claims to be botched Miami investigation's "patsy." Maria Elena Perez, the lawyer representing Ponzi scheme mastermind Nevin Shapiro, is playing the Lee Harvey Oswald card against the NCAA. She claims that she is being made to be the "patsy" in the college athletics governing body's botched investigation of her client's ties with the University of Miami football program. "I did nothing wrong and I was playing by the f------ rules and I am not bound by NCAA rules, and if they did something wrong, it is their problem and they are trying to make it my problem. This is not my problem," she told the Sun Sentinel. Perez then questioned the NCAA's motives. "I don't know what it's all about and I find this very suspicious," she said. "And I'm starting to believe they want (to) intentionally botch this investigation for reasons I can only imagine are monetary." Perez was reportedly "given a list of questions" by the NCAA to ask associates of Shapiro during a bankruptcy deposition unrelated to the Miami investigation who are considered "important witnesses in their case against Miami," whom were not required to speak to its investigators. Shapiro was paid for doing so by the NCAA for her services. Johhny Manziel meets the Dude Perfect crew? Of course he does. The Dude Perfect guys are from Texas, and least one of them, (Tyler Toney a.k.a. "The Bearded Guy) is a Texas A&M fan. With this in mind, it was inevitable that they'd someday around to doing something with Aggie Heisman Trophy winning starting quarterback Johnny Manziel. Insane trick shots ensue, including a DP takeoff of possibly the ultimate Johnny Football highlight, the now-legendary Alabama "bobble" touchdown pass that probably still has 'Bama fans (not to mention the Crimson Tide defense) waking up in cold sweats. Big Tentacles: Denard Robinson, Ohio St., recruiting, and more. You can't spell Twitter without "twit." The B1G Time names the Sept. 7 Michigan vs. Notre Dame game as the best non-conference game in the Big Ten for 2013. The worst? Minnesota at New Mexico State. I'm just trying to find the Bridge...Has anybody seen the Bridge? Johnny Manziel and Aggie teammates join Granger Smith onstage. Spencer Nealy steals the show. It's takes a lot to upstage Texas A&M Heisman Trophy winning starting quarterback Johnny Manziel. Aggie senior defensive lineman Spencer Nealy pretty much did so when he, Manziel, and senior defensive back Dustin Harris came up on stage at a Granger Smith concert in College Station club Hurricane Harry's. The Aggie contingent joined Smith for his ode to his Texas A&M alma mater, "We Bleed Maroon"
Nealy (the big guy on the right) seems to have gotten into the spirit of things a little more than the Manziel did, complete with some of the most...interesting (if awkward) air guitar I've seen in a while. Covering Dixie: Nick Saban gets honored, Mark Richt could get paid, Johnny Manziel goes duck hunting, and more. Covering Dixie Like Mildew - SEC news, notes, and seven Coaches Trophies. Making plays and turning heads. Bubba and Earl Sittin' on the 50 interviews former Southern Mississippi HC Jeff Bower, who was in the running to be HC at Georgia before the decision was made to hire Mark Richt. Track 'Em Tigers looks at Auburn recruiting two weeks away from National Signing Day. 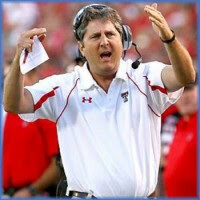 Mike Leach banned from Texas high school after pullling recruit's scholarship offer. Texas high school senior defensive back Myron Turner of DeSoto High School was fully committed to Washington State. He never once went to check out other colleges like other recruits are known to do. Then he got the news that the Cougars' head football coach, Mike Leach, had decided to pull Turner's scholarship offer and give it to another recruit. This left Turner holding the bag two weeks out from National Signing Day without an offer from another FBS school. Turner's coach, Claude Mathis wasn't too happy about this. So much so that he's banned Leach from the DeSoto High campus. Mathis said he understood that pulling offers happens, but that switch shouldn’t occur two weeks away from National Signing Day (Feb. 6), especially when Turner had been steadfast in his commitment and so few other FBS options were still on the table. What made Mathis even more unhappy was that Leach took a visit to DeSoto last week, sitting in Mathis’ office and not once mentioning that Turner’s offer might be at risk. “He didn’t say a thing,” Mathis said. Leach still has a lot of supporters in Texas. Most of which seen nothing wrong with stuffing Craig James' son in an electrical shed. If he continues to do things like this, however, he might just start losing that support. Johnny Manziel with Rick Ross? Johnny Manziel with Rick Ross. Is there anything that really needs to be said about this picture? Other than "hey, look at all those freaky people standing behind Texas A&M quarterback Johnny Manziel and Rick Ross?" Any way any time a Heisman Trophy winner and a rapper are seen together is a must share. Big Tentacles: Denard Robinson, recruiting, and more. Eleven Warriors tries to figure out what's wrong with Iowa. The answer: poor recruiting, lackluster facilities, and issues with assistant coaches. 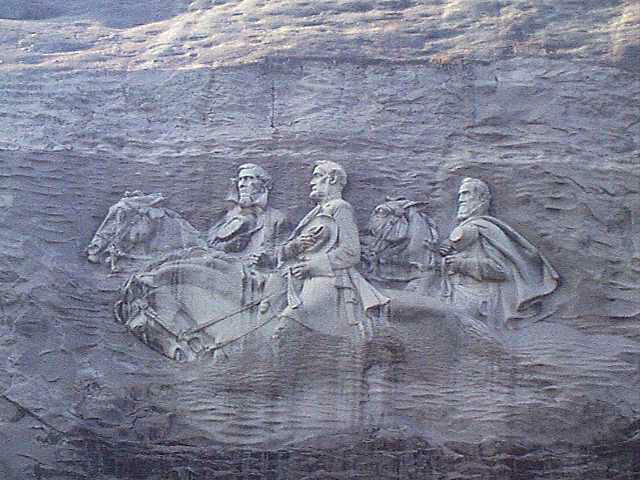 I want to be a history maker in this land. Lake the Posts tries to compare Northwestern's Gator Bowl victory with other major events in recent Wildcat history. Nebraska goes for two also. Covering Dixie: Steve Spurrier, Johnny Manziel, recruiting, and more. Team Speed Kills wonders how much longer South Carolina head football coach Steve Spurrier will remain in the coaching came. Team Speed Kills wonders if Texas A&M can repeat it's blockbuster debut season in the SEC in 2013 with significant losses to its defense. Tray Matthews will be Georgia's next "playmaker." Dubious achievement of the day. Georgia-Clemson game moving to Labor Day? Clemson head football coach Dabo Swinney told USA Today's Dan Wolken that the Tigers' season opener against Georgia could be moved from Saturday, August 31 to Labor Day night (Sept. 2). This would give the game a prime spot on the opening weekend of college football season. Georgia might not have much of a choice, as it's a Clemson home game, and ESPN would probably prefer that game to other options. The Dawgs might be willing to change their minds if the South Carolina game could be moved to later in the season, but that would involve messing with the entire SEC schedule. In the end, I wouldn't hold my breath on the game being moved. File this one under "there's a possibility, but no chance" until some more concrete info comes out. Tyrann Mathieu is trying to be an ex-Honey Badger. One of the saddest stories of the 2012 college football season was the downfall of former LSU cornerback Tyrann Mathieu a.k.a the Honey Badger. Mathieu was kicked off the team before the start of the 2012 season for failing multiple drug tests. He was arrested in October for posession of marijuana, which ended any shot he may have had to return to the Tigers next season. Now Mathieu is trying to rebuild his tarnished reputation and increase his hopes of being selected in the 2013 NFL Draft. To that end, he's trying to leave his Honey Badger persona behind. "I think at LSU, the Honey Badger (person) came to an abrupt end," Mathieu said Monday while watching some of his former teammates practice for this week's Senior Bowl. "I definitely want to do it the right way this time." "I had to take myself out of that situation, out of that environment being around those kinds of people and really start hanging around positive people and are doing what I want to do in my life, which is to be a professional football player," he said. "I feel real good about myself right now." Mathieu's drug-related issues have made his draftability even more difficult than it already was. Despite his remarkable 2011 season, Mathieu's 5'9 ft. height was considered being a little too small for the NFL. Katherine Webb will not be on Dancing with the Stars, is doing Celebrity Diving instead. Have you heard the rumors that Alabama quarterback A.J. McCarron's ubiquitous girlfriend Katherine Webb will be on Dancing with the Stars? Well, they're not true. Webb shot down that rumor herself on Twitter. What Webb is reportedly doing instead is even more ridiculous. It's an ABC show called Celebrity Diving, where she will apparently be competing against the Detroit Lions' Ndamukong Suh, legendary NBA Hall of Fame Kareem Abdul-Jabbar, and former cute Cosby Show child star Keshia Knight-Pulliam. Olympic gold medalist diver Greg Louganis is the host. Celebrity Diving is scheduled to premiere on March 19. Western Civilization is set to end sometime after. The Ruins: Dayne Crist, Trey Millard, recruiting, and more. Just give him the darn ball! Baylor player profile of the day. Blatant Homerism looks at Oklahoma recruiting. The Smoking Musket looks at West Virginia recruiting. Covering Dixie: Luke Joeckel, tons of recruiting news. 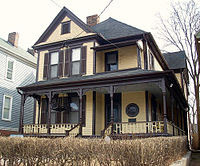 Boyhood home of Dr. Martin Luther King Jr. in Atlanta. Speaking of Luke Joeckel, the Aggie OT takes over the top spot in SB*Nation's 2013 NFL mock draft as the first overall draft pick going to the Kansas City Chiefs. Mississippi state billboard war update. Good Bull Hunting looks at Texas A&M recruiting. Unquiet: Mark Helfrich, lots of recruiting news, and more. Unquiet on the Western Front - Pac-12, MWC, and BYU news and notes. I'm just carryin' on an old family tradition. The Hunter Gets Captured By the Game. Is the Big Ten set to add Virginia and another ACC team to it's ranks? Is the Big Ten expanding again? Reports say that the conference, which recently added Maryland and Rutgers to its ranks, could be adding Virginia and one other ACC program. An announcement could come on Monday. The other ACC school's identity is up in the air, with rumors swirling that it could be Georgia Tech, North Carolina, Duke or Florida State. This confusion over the other ACC school or schools to be added are enough to warrant a "the voices in your head don't count as reliable sources" warning. The involvement of Virginia in the story would be enough to call "bull" on the story, if it wasn't for the fact that the B1G just let Maryland in. The Fallout: Manti Te'o, Oregon, Mark Dantonio, and more. Least. Shocking. Moment. Ever. Of the day. Manti Te'o's girlfriend was at the Dallas Stars game tonight. NHL hockey is finally back. and the dozen or so millions of hockey fans remaining in America are ecstatic that the lockout is over and the season wasn't canceled. 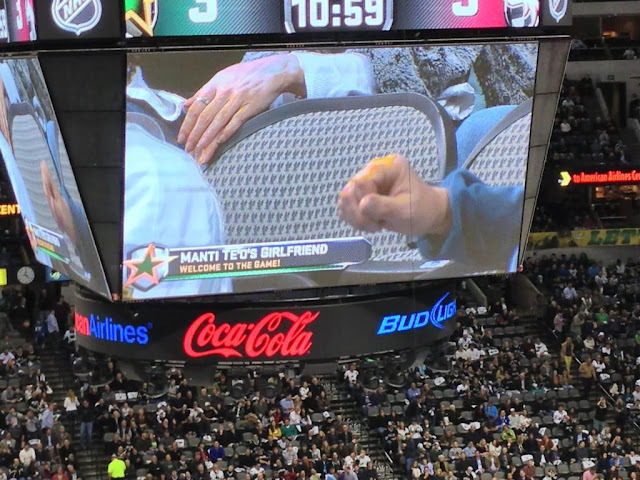 One of them, apparently, was Manti Te'o's imaginary girlfriend, Lennay Kekua, who was in attendance of the Dallas Stars first game of the season. Yes, these jokes are gonna continue for a while. And theyre pretty much already old. 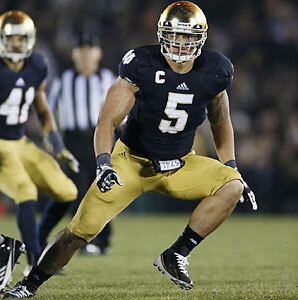 The Fallout: Manti Te'o, Luke Joeckel, Kliff Kingsbury, and more. Welcome to the Fallout - So, did anything interesting happen last night? Notre Dame linebacker Manti Te'o spoke to ESPN's Jeremy Schapp about Catfishgate Friday night. I'm just sitting here watching the wheels turn round and round. 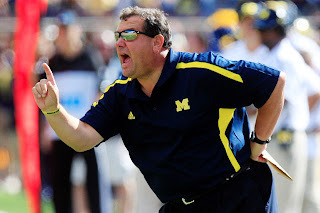 Brady Hoke has a potty mouth, says Michigan "had a s****y season" in 2012. Michigan head football coach gave a very honest assessment of the Wolverines' 2012 season while speaking in front of a group of Michigan state high school coaches on Friday morning. Maybe a little too honest. "We had a s****y season, to be honest with you," Hoke said at the MHSFA's Winner’s Circle Clinic. "Bad year, to be honest. Proud of the kids, how they kept moving forward, but it wasn't the year Michigan deserves." Hoke may want to prepare himself for a visit to Michigan athletic director Dave Brandon's office when he gets back to Ann Arbor. That and a mouthful of soap. Minor League franchise in Kentucky to honor Manti Te'o girlfriend hoax with a bobblehead promotion. The Manti Te'o "Catfishgate" scandal is giving a minor league baseball franchise in Florence, Kentucky a chance to do what minor league sports franchises do best: exploit current events with insane promotions to sell tickets and get publicity. The Florence Freedom, an independent member of the Frontier League has declared May 23 "Manti Te'o Girlfriend Bobblehead Day." The team plans to hand out 1,000 bobblehead boxes to honor Te'o's imaginary lover - 1,000 empty boxes. But wait, there's still more insanity for this promotion. There will be an air guitar contest, an imaginary food fight, and a section where fan being their own imaginary significant others with them. And the pièce de résistance to top everything off, a special Kiss Cam where fans can pucker up with their imaginary lovers. Of by May 23, this whole debacle will have probably blown over, but that's never stopped a minor league team before. Johnny Manziel saya he was "#mindblown" about Manti Te'o scandal on Twitter. Johnny Manziel with Manti Te'o at Heisman Trophy ceremony. Via SI.com. Did Texas A&M quarterback Johnny Manziel have anything to say about the catfishing scandal surrounding Notre Dame linebacker Manti Te'o, the man he beat out for the Heisman Trophy? Of course he did. Did he say it on Twitter? Of course he did. Manziel first tweeted about the scandal on Wednesday saying "Just so people know the media doesn't always paint the correct picture.. They just care about getting a good story and nothing else matters." He then added "Will be just as shocked as everyone else if it's true, " with the hashtag #waiting" added. His most recent tweet about the Te'o incident was simply "#Mindblown." Manziel also said in an interview with ESPN that he was "just as shocked as anybody else." Covering Dixie: Manti T'eo, Georgia, and more. Covering Dixie Like Mildew- The SEC. 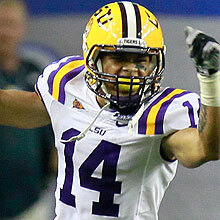 Josh Levin at Slate tried to compare the Manti T'eo situation to that of former LSU cornerback Tyrann Mathieu. Only with less pot. A.J. McCarron's mom talks about Katherine Webb. Alabama TV station WPMI caught up with Dee Dee Bonner, mother of Alabama starting quarterback A.J. McCarron. Obviously, the main subject of interview was McCarron's relationship with his girlfriend, Katherine Webb. Bonner discussed some of the criticism of the media frenzy surrounding Webb since the BCS title game. "Of course, she's getting negative press, people saying she's asking for this," Bonner said. "The only thing this poor baby did was come to a ballgame to see her boyfriend play. She hasn't asked for any of this. AJ hasn't asked for any of this. It's evolved." Bonner also denied that McCarron has asked Webb to decline any interviews. "I'm a prideful woman, so I told her you don't let a man tell you what your're going to do, first of all," a laughing Bonner told the NBC affiliate. "AJ has not told her to decline any interviews or anything like that." Here's the full interview here, including Bonner's comments of Webb's hiring by Inside Edition to cover Super Bowl XLVII. The Ruins: Kliff Kingsbury, Charlie Weis, recruiting, and more. Kliff Kingsbury = Pat Fitzgerald? Just Wait Til Next Season compares Texas Tech under new head football coach Kliff Kingsbury to that of Northwestern and its head football coach Pat Fitzgerald. JWTNS wonders if the school will be able to realize that its in the same situation Northwestern was in when Fitzgerald was hired, and support him through what could be more rough waters in his first season or two than Red Raiders fans might expect. Suttles scuttles Iowa St. commit. Manti T'eo's infinite fake dead girlfriend playlist. You have probably heard by now about the news of Manti T'eo and his imaginary dead girlfriend. This is either the biggest case of fraud in Notre Dame, or the worst case of catfishing ever. Saying that, SWRT has found out the playlist T'eo had come up for his faux cyber-paramour. Here are a few of the selections. Unquiet: Lane Kiffin, Steve Sarkisian, and more. Johnny Manziel wins the Manning Award. Alabama fans wait in line for BCS title swag. Aaron Murray returning to Georgia in 2013. Bill O'Brien leaving Penn St. for the NFL? The Ruins: Fiesta Bowl, Bob Stoops, and more. Your New Year's Day 2013 bowl schedule.